1.Compatible for ring and earring. 2.Protect surface,against abrasion and scratching marks and dust. 3.Lightweight and proper size,you can hold it in hand. 4.Exquisite craft and LED lighted design,is amazing and special. 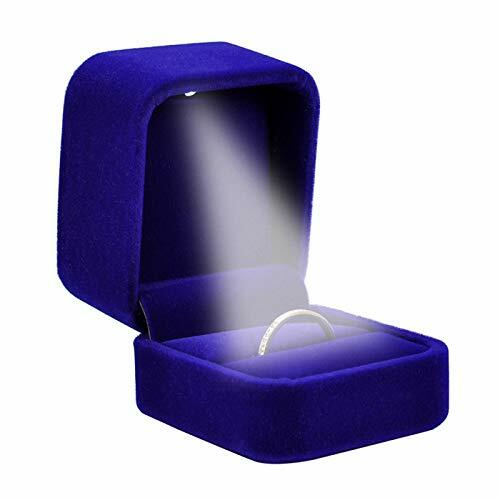 5.Spot light shines directly down jewelry bring out amazing. Made of Premium and Environmentally Friendly material with Luxury velvet interior.It's Safe,Non-toxic,Polished with piano painting. Luxurious design makes your ring box look Unique and Elegant.Great for special occasions. Led lights automatically turn on when you open the box. Perfect organizer for your ring,add value on any gift content inside. Easy to carry,you can easily fit in your pocket,It will help you create a romantic atmosphere with the LED Light. If you have any questions about this product by TOYYM, contact us by completing and submitting the form below. If you are looking for a specif part number, please include it with your message.